Gather resources and explore a charming world. Written by Nate Lakritz on February 6th, 2019. 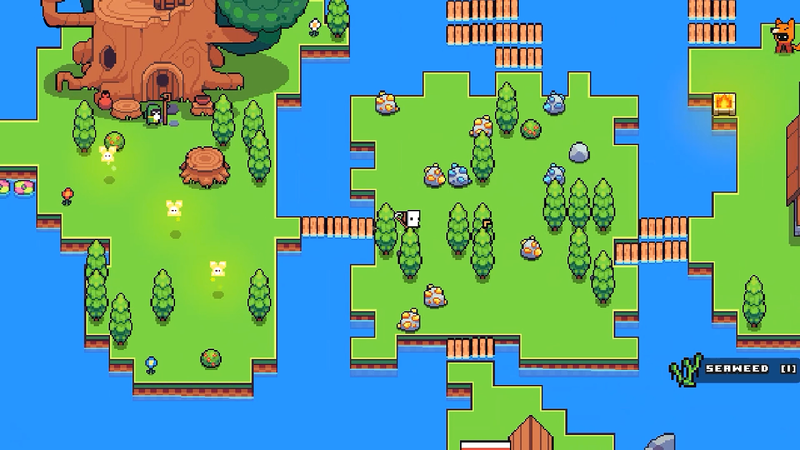 Heavily inspired by Stardew Valley and similar role-playing exploration games, Forager is a colorful adventure through the pixelated frontier. As you gather and craft resources, the world of Forager gradually expands and offers new challenges. While there aren’t any defined goals specified in the game, plenty of sandbox-style fun can be had as you explore and experiment with various crafting recipes. Upgrading your character, collecting rare items, helping out NPCs, and solving mysterious puzzles are all part of your journey. 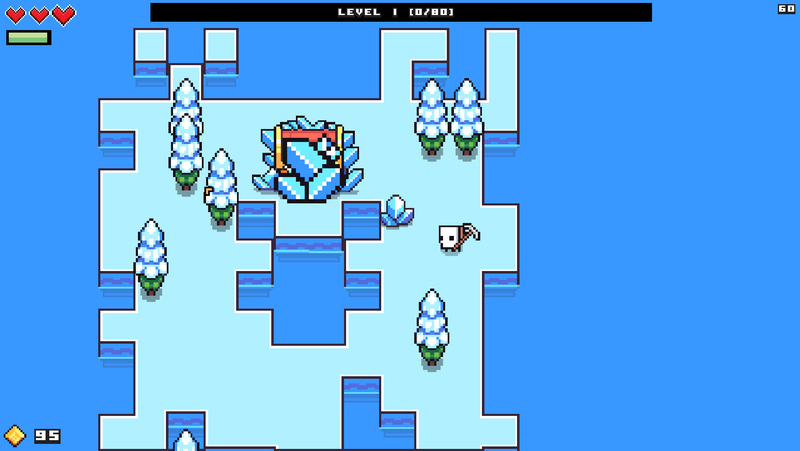 Forager’s core consists of collecting natural resources with your trusty pickaxe. You’ll start by struggling to chop down a single tree and eventually be able to mow down entire forests with ease. Upgrading your essential items like armor, tools, and storage is key to advancing through the game. Several buildings and upgrades will aid your progression by unlocking useful crafting recipes, leading to new possibilities in interacting with the game’s environment. There isn’t much to guide the player, so you’ll often have to experiment around and see what happens. Common sense is usually enough to figure out what to do next, although I had some trouble figuring out how to obtain certain biome-restricted resources like bones and crystals. The inventory system is somewhat restrictive considering the large number of items that exist in the game. I continuously found myself running out of inventory space and having to clean out my backpack. Upgrading storage always took priority over other upgrades. Just a few more backpack slots to make large crafting recipes less intimidating would definitely make inventory management less of a chore. Also, many items are essentially useless and only exist to clog up space — another reason why more slots are needed. You’ll start off with a single plot of land to explore and can purchase new ones with gold coins. Forager’s currency is actually obtained by smelting gold ore and directly crafting the ingots into coins. It’s interesting to be able to craft your money rather than obtain it through the more typical means of selling items or slaying monsters. Eventually, you will be able to instantly sell items straight out of your inventory for coins, but I found constructing a massive gold mining operation much more fulfilling. Land itself is valuable and usually contains some sort of optional puzzle with massive rewards if you manage to solve it. If you had to place one ultimate objective on Forager, it would be purchasing all of the game’s 50 land plots and reaching the final frontier. Character progression is done via a fine-tuned skill tree. You’ll gain XP for essentially anything you do, which allows you to level up and gain skill points to spend. Some of these character upgrades are really creative and allow you to customize your playstyle. They’re divided into general categories which include magic, industry, economy, hunting, and more. Combat is fairly limited and dying doesn’t do anything to hinder your foraging. You’ll be sent back to the title screen where you can immediately respawn right where you died without losing any items. Also, you won’t find yourself in this situation very often. Killing monsters is as simple as a few pickaxe swings and replenishing hearts isn’t a difficult task due to a plethora of easily obtained consumables. 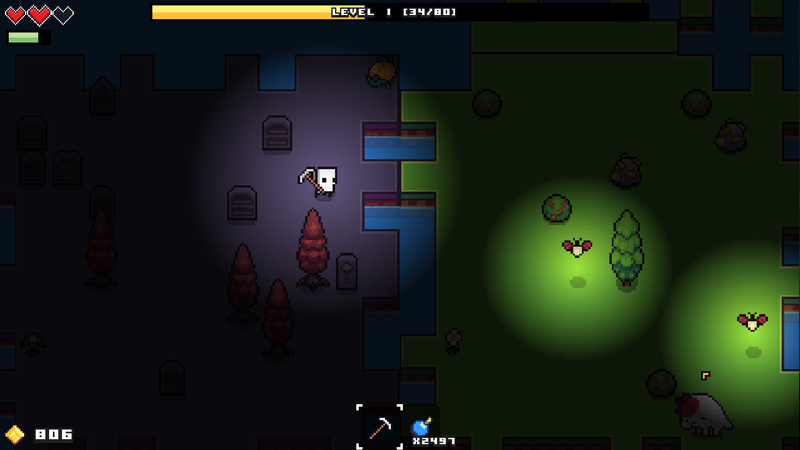 I think the forgiving nature of Forager’s combat works well with its focus on friendly exploration. In fact, the puzzles will be your only real challenge. As can tell, Forager’s gameplay gets quite complex under the hood. The game is a light-hearted adventure, but still contains a deep skill tree and huge item lineup. It really tries to avoid any sort of grind by throwing in random events and the overall challenge of managing everything. It makes itself unique from indie juggernauts like Minecraft, Terraria, and Stardew Valley by never getting too similar to any of those titles. Building your colony is less of a focus than foraging for resources, and yet I never felt like I was being restricted by the lack of a pure sandbox or open world. The game’s graphics are charming with an indie feel and vibrant colors. Even through the entire game takes place on a relatively small grid, each biome has a very unique theme to it which makes Forager’s world seem diverse. Lastly, I should mention the soundtrack is fantastic and makes you feel primed for adventure. I haven’t played a game as addicting as Forager in quite some time, and it was refreshing to truly get hooked. 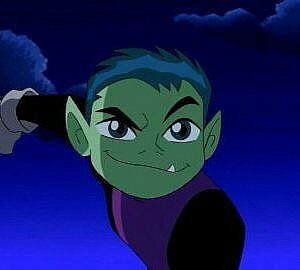 Feeling excited to jump into this world and consistently enjoying my time with it was a real blast. I predict an amazing response for Forager as it jumps from the indie scene to Steam, PS4, and Nintendo Switch. It will surely be a highlight on the Switch considering its family-friendly theme and the portability factor. 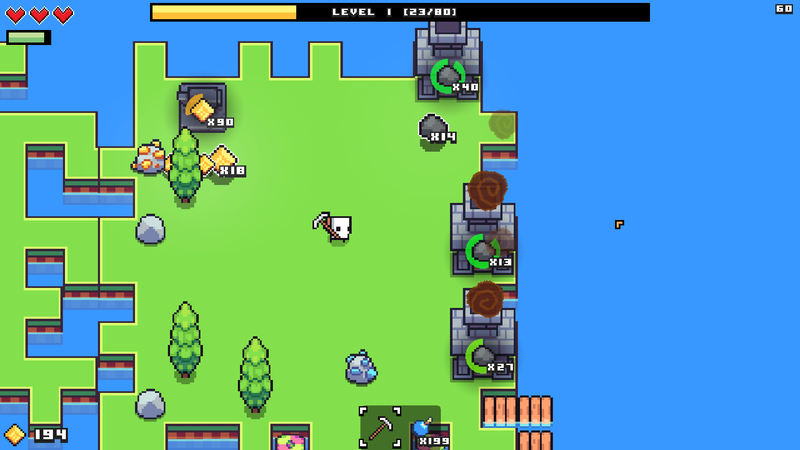 Progression: Forager's progression system is one of the most polished I've ever seen. It's not overly complex to the point where you'll get confused, but offers a lot of freedom to the player. Graphics: The game's visuals are colorful, clean, and pixelated. Sound: I love the soundtrack and could listen to it for hours without feeling any fatigue. It aligns with the game's vision perfectly. Gameplay: Inventory management is my only complaint with the game, as everything else is reasonable and entertaining. Fun Factor: Forager is addicting and fun for all ages. The characters and world are lovable and gameplay never gets too intimidating. Final Rating: 9/10. I haven’t played a game as addicting as Forager in quite some time, and it was refreshing to truly get hooked. Feeling excited to jump into this world and consistently enjoying my time with it was a real blast. Collect, craft, and explore your way through a charming world.